Any kind of cake mix will do! 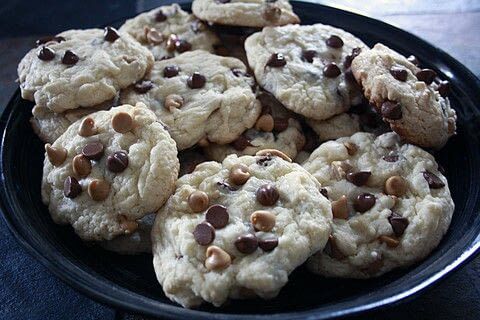 My personal favourite is to use German chocolate mix, and use peanut butter chocolate chips!! The cookies in the picture were made with French vanilla cake mix, chocolate chips, peanut butter chips, and walnuts! You shant be disappointed! 1 box Cake Mix 1/2 cup Butter 2 Egg(s) 1 tsp Vanilla Extract 1 cup Chocolate Chips or candy covered chocolate pieces, walnuts, raisens, etc! In a medium bowl, stir together the cake mix, butter (melted!) vanilla, and eggs until smooth and well blended. Mix in the chocolate chips. Drop by spoonfuls onto ungreased baking sheets. Bake for 10 minutes in the preheated oven. Allow cookies to cool on baking sheet for 5 minutes before removing. we use 3 eggs right? lol sorry im clueless! Use only half a cup of butter!! I keep trying to edit the ingredients list, however it's not working...maybe a glitch...? That's very interesting! I'll have to try this someday! what a coincidence...i made these last night and now i see it here!